I became disabled person when I was 22 years old in a car accident. There was a very marked change in people’s behaviour towards me, and one of the first things that struck me was the charitable attitude of the “non-disabled” people towards persons with disabilities. I can recall clearly one incident that occurred not long after I became disabled that became a turning point in my life. “While I was in the queue to enter the temple at Haridwar, a poor middle-aged woman from the village walked up to me and handed me a twenty-five paise coin. I was sitting casually dressed in a nice T-shirt and trousers, and I looked up at her confused. Why was she giving me money? My instinctive reaction was to fumble out: ‘No, no! This is not mine.’ I thought that she imagined I had dropped the coin and was returning it. But before other words could come out of my mouth, the woman had left. For several moments, I just sat there, looking at the coin in my hand and the lady walking away. It took time for my brain to analyse what had just happened. This was something that had never happened to me before, and I had not imagined that it would ever happen—she had thought that I was a beggar! The only thing that distinguished me from everyone else there was my using a wheelchair. The woman had thought me a beggar simply because I was disabled! She had assumed that because I was disabled I was needy. I did not know how to react—whether to laugh at her naiveté, or feel sad about what I had been reduced to. With her one little ‘charitable’ act, the woman had managed to make me question my own being. I laughed off the incident, deciding to keep the coin as a reminder of this bizarre encounter. In reality, however, that was a defining moment of my life. It was a reaffirmation of what I had always been aware and conscious of—that people judged me on my outward appearance alone. No one seemed to have the time or inclination to get to know me as a person, with my own strengths and weaknesses, just like anybody else. Providing me with charity was probably much easier than to try and really understand what I needed. Ever since, my struggle has been to dispel this charity. 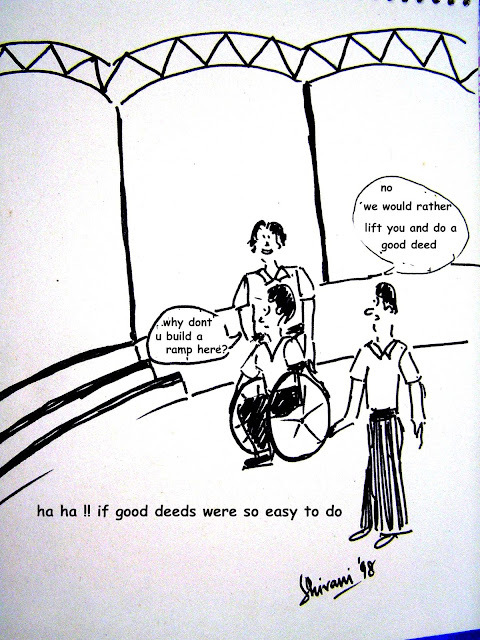 One of the main reasons for this charitable attitude is because disabled people are unable to participate in regular activities such as education, employment, entertainment etc. due to their inaccessibility and very importantly, peoples’ attitudes. These result from lack of various basic aspects such as suitable physical infrastructure, access to information and communication, access to the public transport system and general public awareness. Lack of accessibility results in the denial of basic rights of persons with disabilities. Driven by the importance of accessibility for persons with disabilities, I enrolled as a full time student for a diploma in architecture technology at the age of 32, and followed it through with a post graduation in Inclusive Environments from the UK. On my return I started AccessAbility (www.AccessAbility.co.in), which provides consultancy to service providers and employers looking at making their service or work place more accessible and welcoming to persons with disabilities. Initially, we had apprehensions if we would get clients who would be willing to pay for our services especially because disabled people are not perceived as patrons by businesses. However, we found takers in businesses who saw value in improving accessibility and some of whom include the ITC Hotels, Indian School of Business, Select Citywalk Mall, UNDP office, Hyderabad Central University, Chennai Mathematical Institute, to name a few. I had visited the temple with colleagues from the centre. I wasn’t allowed to enter the temple in my wheelchair as it was considered impure. After a great deal of hesitation, I allowed one of my colleagues to carry me in his arms to have darshan of Goddess Kanyakumari. I didn’t know better, so I agreed to be carried; but it was one of the most humiliating and embarrassing experiences of my life. Everybody ogled at us as my colleague carried me. Another colleague walked along with us, assuring each person who stared that I couldn’t walk. It was quite a long way till the deity, and the only thing I was glad about was that I wasn’t too heavy during those days and that the pandits were ‘considerate’ enough to not make us wait in the queue to get in. It is unfortunate that people with disabilities get left out, often as a result of poor design or being excluded at the planning stage. Not intentional, one understands but there is little being done to arrest such exclusion. 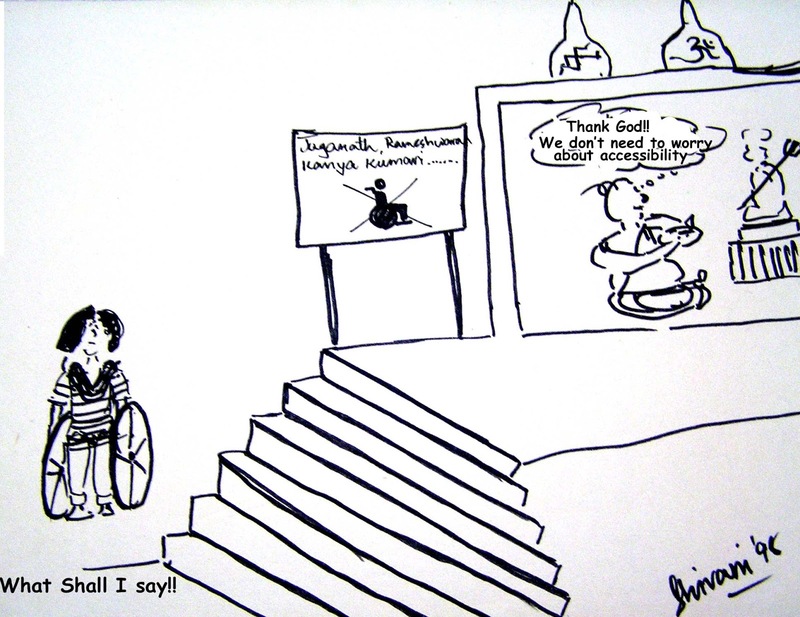 Government policies show apathy towards disability rights. Even after ratifying the Convention on Rights of Persons with Disabilities, the government outlook is pegged on charity and social protection rather the equal rights and opportunities. Building bylaws in all States and Union Territories of our country do not mandate accessibility and building permits are given even if they are inaccessible. We do not have accessibility standards and the government procurement system does not ensure that tender specifications look at accessibility for disabled people. Disability must be looked at as a developmental issue and must be addressed in all development agendas. For instance all government projects, schemes and plans must address inclusion of persons with disabilities. It is sad that flagship programmes such as Jawaharlal Nehru National Urban Renewal Mission do not mandate accessibility for persons with disabilities, thereby continuing to create barriers for them and preventing their inclusion. The move towards recognizing disabled people as equal right holders is extremely slow. Often people are uncomfortable interacting with disabled people because of lack of awareness and also because disabled people are often not seen out and about, because of inaccessibility. From my experience I can say that it is not the impairment that disables us, but the inaccessible environment and strange attitudes and misconceptions that are disabling. There is a long way to go. Persons with disabilities cannot walk the way alone, the government and the society at large must walk hand in hand with them to bring about some meaningful change towards creating a more inclusive environment.